Ta Na Wa Káwstem (“The Descendants”) is a Squamish performing arts group based in North Vancouver, British Columbia. The group formed in the summer of 2017 with a focus on cultural strength and language identity. 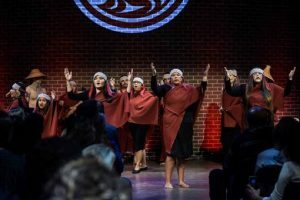 Their performances weave together a continuum of Squamish song and dance with historical songs, contemporary songs, and an attention to a presentation that is visually and culturally stunning. The group is grateful to predecessors who created the trail they walk on today.